Is it a Supermoto on steroids? Is it an urban scalpel, designed to cut through traffic and city congestion? Or is it just the most fun Ducati ever built? Ducati’s Hypermotard 939 is possibly all of the above, a lightweight open-class machine which, despite what seems like a single focus design brief, is remarkably versatile. Check out the style. In red it looks sporty and aggressive, like it’s about to eat a pedestrian at the first opportunity. In white it looks like it’s going to eat anyone who tries to get in front of it. The red and white SP version looks like it’s going to eat Pikes Peak. From its beak-like nose to the long-travel suspension to the stand-out trellis frame to the flat seat to the single-sided swingarm, the Hypermotard looks purposeful, tough and uncompromising. Throw a leg over the stratospherically high seat and it still feels that way. The riding position is Supermoto, thanks to the flat ’bars and ever so slightly rearset footpegs. Ducati offers a variety of seats so those of short stature can reach ground easier, and wimps like me can order extra padding, for the standard seat is pretty hard. Supermoto (or Supermotard if you prefer) was born out of dirt bikes converted for racing combined dirt and bitumen circuits – Ducati has stolen the concept from the dirt bike world and built one of the biggest, toughest machines of the genre with the Hypermotard. So Ducati doesn’t have a history with Supermoto racing, but it’s built the biggest, baddest and toughest Supermoto of the them all, because it had to use a twin-cylinder motor and it wasn’t quite so fussed about off-road capability – this is a road bike quite at home on loose surfaces, but don’t take one up a fire trail. 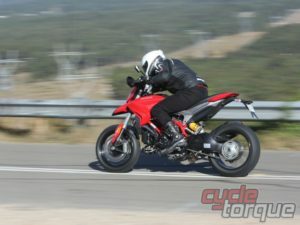 The riding position is aggressive, with the wide ’bars, flat-ish seat and long travel suspension, you’re sitting up, ready to throw the bike around, which is what gave the older model the edge up Pikes Peak – but now the Multistrada, with over 40 more horsepower, is the obvious choice for that task today. 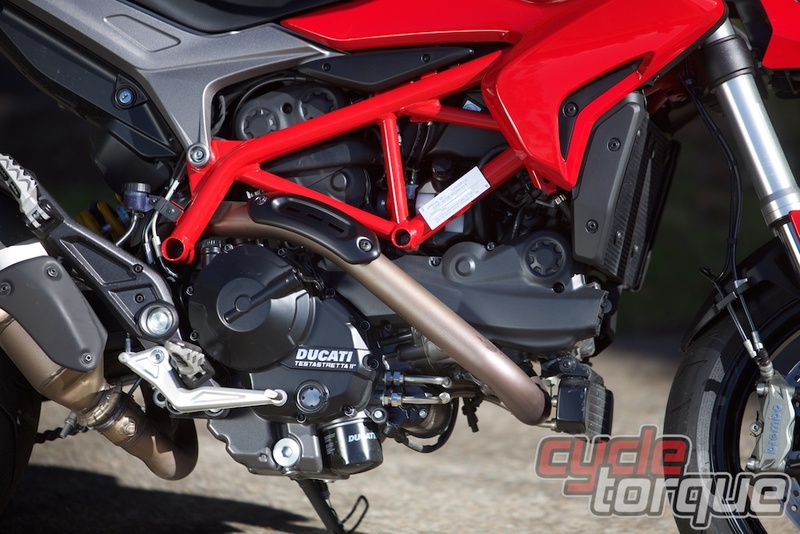 You could be forgiven for thinking Ducati’s simply bored-out the 821 by an extra 6mm to raise capacity to 937cc, but there’s more to it than that, of course. The crankshaft has been replaced and new pistons, cylinder heads and barrels are fitted. Compression is up to 13.1:1, so give it good fuel. Feeding the engine is 52mm throttle bodies via a ride-by-wire throttle, unchanged from the 821. Fuel exits through a new two-into-one system with a new exhaust valve. There’s a slick six-speed gearbox and slipper clutch, awesome for backing it in. Maintenance of the valves is only required every 30,000km, reducing the cost of ownership. Taking on the urban grind requires good visibility, manoeuvrability at low and moderate speeds, a slim profile to filter through stopped traffic and good acceleration to get away quickly from the lights – all of which the Hypermotard has in spades. I can’t think of a lighter, narrower, more svelte open-class machine. If the seat height doesn’t get you, this bike is an awesome commuter (well, it’s a bit expensive for me to recommend it for commuting, but it sure is capable and fun! ), suburban blaster and inner-city kerb-jumper. The long travel suspension makes getting up and over footpaths and other obstacles easy. The high ’bars slide over car mirrors well, but be careful of 4WDs. The steering lock is generous (especially by Ducati standards), letting you get around traffic without doing to many three point turns. The 113HP engine has more grunt than the 821 models it replaces, with a claimed 18 per cent more torque in the midrange. The three riding modes are Sport, Touring and Urban, while there’s two levels of ABS and eight of traction control. Everything’s configurable through the comprehensive LCD instrument panel. Sport and Touring offer the same peak power, with snappier power delivery in Sport mode – it’s easier to ride but not as aggressive in touring. Urban drops the power to 75HP and is good in the wet, stuck in traffic and for those getting the hang of a big bike. The USD forks are from Kayaba and the shock from Sachs, with the brakes by Brembo. 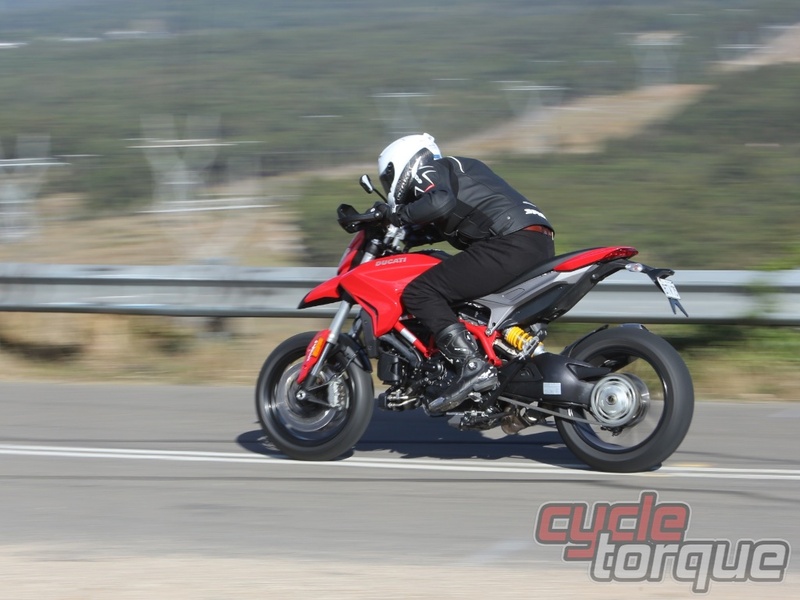 Out on the open road you do feel a little like a windsock… so if you do that a lot, maybe the Hyperstrada, with its 20mm higher handlebars, panniers, power sockets and centrestand might be a better choice. The Hyperstrada is priced at $19,490 (+ORC) and comes with Pirelli Scorpion Trail Tyres, reflecting the dual-purpose roots of the genre. Ride days, especially on short, tight circuits, are awesome on Supermoto machines, and the Hypermotard loves them. At $21,990 the Hypermotard SP is the cheapest way to get factory-supplied Öhlins suspension on an 8-valve Ducati, and if you take one to a ride day at short circuits like the Southern part of Sydney Motorsport Park (the Amaroo circuit) you will have an absolute ball. The SP version weighs in at just 178kg and features revised riding modes (Race, Sport and Wet) combining with 3-level Ducati ABS and traction control. 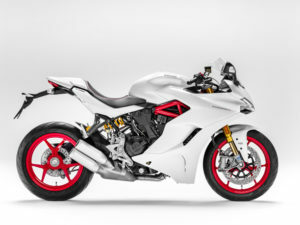 Ducati’s done it again, charging more for the white one than the red. The Star White Silk version is priced at $17,990, the red one $200 less. No idea why, it just is…. 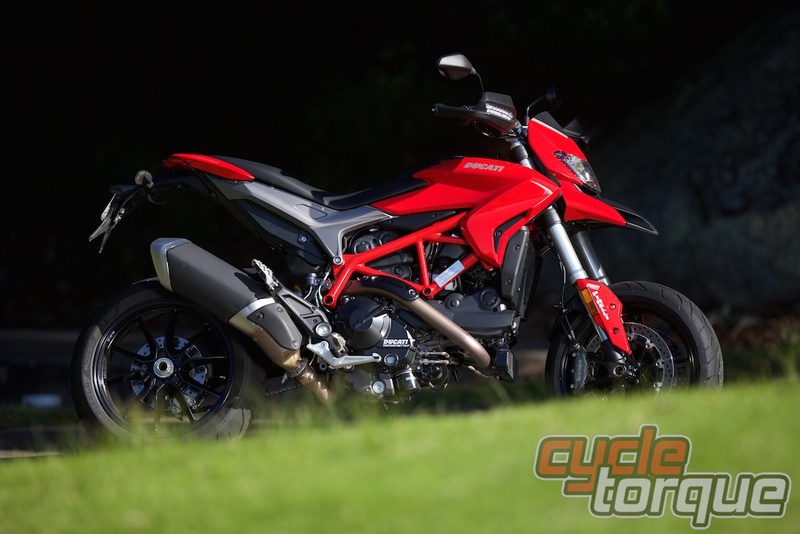 This slots the Hypermotard in between the 821 Monsters (from $16,490) and both the Monster 1200 and 959 Panigale ($19,990). They pack a lot of sporting ability, with road-going versatility, for the money. 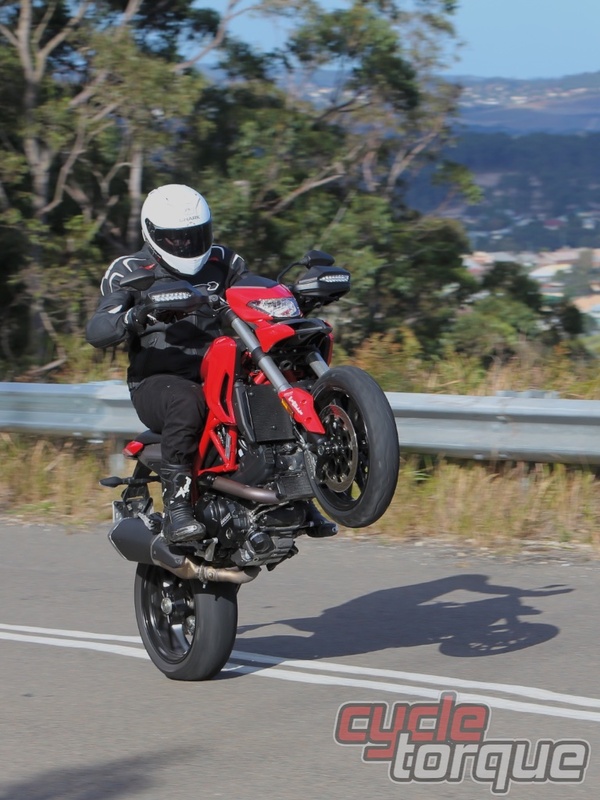 Yes, the Hypermotard does stir the soul, and yes, you can ride it hard and fast, and it’s fun to do so. But it’s actually a ‘civilised beast’ when it’s ridden by a normal, mortal human. The style, the feel and the sound is all hyper. It makes you want to believe it’s more than simply a machine – it’s a Hypermotard.